With regard to performance management practices in the organization, maturity relates to the adoption level of dedicated performance management tools, the shaping of internal performance management processes, the mechanisms, processes and relations through which performance management systems are run and administered, the build of the performance management architecture itself and the degree of performance management system integration. Organizational maturity frameworks provide a transitional set of common characteristics against which maturity can be assessed. The performance management perspective on organizational maturity provides us with five levels of evolutionary growth. Each level is characterized by a common approach towards the organization’s main operational levers: Tools, Processes, Governance, Architecture, Integration. The “Initial” or “Inceptive” organization, although curious about performance management practices, is not generally familiarized or is completely unaware of performance management tools that can support the implementation of the performance management system in the organization. While the organization is vividly trying to lay the foundations of the performance management system itself, its processes are too inconsistent. Despite the disconnect in internal processes and activities overlap the organization is overly focused on immediate outcomes. The performance architecture is itself incipient with strategic planning practices that are mostly informal and mainly rely on top management experience. Performance measurement is not a common practice in the organization. It is either nonexistent or very limited. KPIs are vaguely defined for the organization with no formal consensus regarding the KPI calculation methodology, nor any centralized evidence of the KPIs monitored. There is a poor organizational identity and unclear direction, which translates into limited awareness of employees in regard to what matters for the organization and limited transparency in actions and performance levels. The outputs of organizational initiatives are unidentifiable as accountability is unclear and there is limited visibility into the manner projects are linked to organizational objectives. At this maturity level, a lack of active involvement from senior management to support the Performance Management Architecture is commonly encountered. Internal communication systems are not yet well structured and there is a poor overall knowledge level with regards to what performance measurement and management systems generally imply. Usually, this generates a weak acknowledgment towards the importance of using Key Performance Indicators (KPIs). There are no initiatives used to motivate or increase engagement levels among employees. Innovation is not facilitated in any way and individual performance is not measured or rewarded. The “Emergent” organization will have begun to discover and experiment with performance management tools. While internal processes are uncoordinated and performance management tools still unstandardized, the need for improvement is strongly enunciated. Activities for consolidating performance management practices in the organization are planned and expectations defined. In the case of emergent organizations, the performance management architecture can be perceived as transitional. The strategy at this maturity level is a formal documentation that does not provide the added value expected. There is poor formulation of organizational objectives and mis-alignment between different levels of the organization, mainly due to ineffective communication. Some of the basic performance measurement practices such as KPI selection and KPI documentation are slowly employed by the organization. 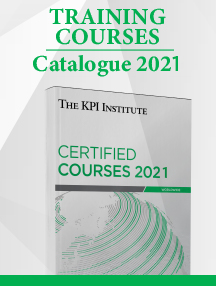 The KPI selection process is exercised without minding designated criteria, methodology or techniques. Some of the KPIs selected are also documented, although there is no standardized approach towards the use of KPI Documentation Forms/Templates. Data collection is becoming more structured, and in some areas of activity visual representation tools are used to track the progress of KPIs. Although there is a formal process of reviewing and reporting on performance, performance review meetings do not deliver the much-needed insight into decision-making the organization might require. A performance-oriented culture exists but is not supported by consistent communication initiatives from leadership. Senior management is aware of the importance of measuring performance and has a basic knowledge in this area, but there is a certain formality with the efforts submitted in this direction. Managerial positions are accountable in terms of performance results, but measuring individual performance is not a widely used practice in the organization. The “Structured” organization will have already selected and defined the most suited performance management tools for the organization. Such an organization will have already gained control of the its main performance management processes. There is a well-coordinated effort in standardizing performance management practices across the organization, there are defined process flows and upgraded process activities. The approach towards adopting the performance management architecture is however still inconsistent. Strategy monitoring tools, such as scorecards, dashboards and portfolio of initiatives are used, however they are not cascaded at the lower levels of the organization. A more structured approach towards selecting Key Performance Indicators (KPIs) is observed. 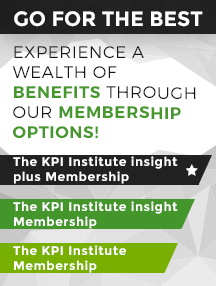 KPI selection criteria is clearly defined and commonly agreed by internal stakeholders. KPI selection tools and techniques are gradually enhancing the KPI Selection process. A streamlined KPI documentation process is employed based on a standardized KPI documentation form. The process of setting targets for KPIs is becoming increasingly comprehensive, by means of data sourcing, market data comparison and benchmarking. The reporting process relies on standardized templates and guidance to create the final report. Performance review meetings take place at the end of each performance management cycle and are well-organized. As learning and improvement is not yet formalized in maturity level 3 organizations, progress seems to happen rather naturally. The performance culture is supported by a strong business case for measuring performance across the organization which is communicated across the organization. Awareness level among employees is moderate to high in relation to organizational main objectives and performance levels. Templates and procedures are developed to support the performance management cycle. The governance of the system is well defined. 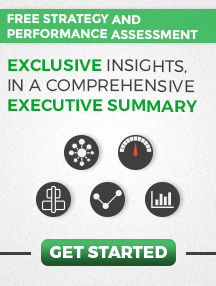 In most cases, employee performance is tracked, and it involves assessment of individual objectives and KPIs. Rewards are offered to employees as well as training opportunities to ensure performance improvement. The “Integrated” organization carries out a dynamic process of continuous change. There is an overall effort of increasing efficiency through waste reduction, while performance management processes are becoming cross-functional and streamlined. The main focus of the organization revolves around cascading and alignment. There is a general acknowledgement of the benefits that such tools bring to the organization. The cascading of the performance management system is closely monitored. The wider purpose is achieving homogeneity. Performance measurement is a process that adds value to the organization, through the effective use of performance management tools and adequate system governance. An integrated selection process for Key Performance Indicator (KPIs) is observed and a streamlined KPI documentation process is already employed. The KPI target setting process is increasingly complex. Data gathering is supported by a standard software solution and most of the KPIs are monitored in scorecards and dashboards. Business Intelligence tools are also commonly used for reporting, which makes the process relatively fast and accurate. The performance culture relies on effective communication that reaches all internal and external stakeholders. 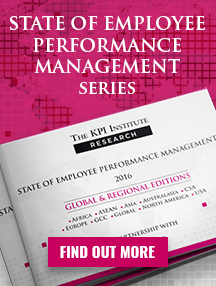 Performance Managements is structured as an organizational capability. 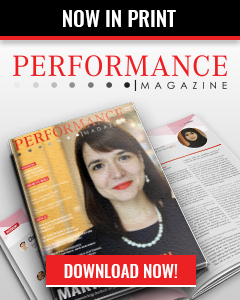 Performance measurement is integrated in all activities at all organizational levels and enables a certain level of autonomy in the working environment. There is a strong culture of learning and improvement, which captures innovative ideas. Employee performance evaluations are aligned to the entity’s strategy and performance is stimulated through a combination of financial and non-financial rewards. Investments are made to constantly improve the quality of the working environment and the employee engagement. The “Optimized” organization will have used standard performance management templates and perfected and/or automated them. Performance management processes have been tested and trialed. There is a whole process of re-engineering and re-positioning them for the better benefit of the organization. The system is transparent, SMART initiatives enable continuous performance improvement. Strategic planning is an important organizational process which is well integrated with other key processes. The strategy itself relies on simple and clear tools. Awareness on what the organization desires to achieve is high even among front-line employees. Performance measurement is an important organizational process which is well integrated with other key processes. KPIs rely on simple and clear tools to collect data. At this maturity level, in most cases, there is a state-of-the-art selection process for Key Performance Indicators (KPIs). All monitored KPIs – operational or individual – are aligned to the corporate strategic objectives. A centralized KPI library consolidates the internal know-how on how KPIs are calculated and reported in the organization. Usually, the target setting process sets meaningful performance levels, which trigger positive behaviors from employees. The process is completely automated, systems are integrated and rely on the latest technology in terms of Business Intelligence. All KPI results are displayed in dashboards and scorecards compliant with data visualization best practices. Modelling and other advanced data analysis techniques are commonly used by organizations with optimized performance management systems. These organizations usually rely of Business Intelligence tools to report on performance and track progress of organizational initiatives. It is characteristic of organizations at this level to have a flexible performance management system able to easily adapt to changes. The performance management system is widely used within the organization and the stakeholders are actively engaged to improve the current processes. There is a strong learning and improvement culture. The organization has managed to translate performance management into everyone’s job. The role of each employee is clear. This enables staff members to make consistent decisions aligned with what the organization aims to achieve. At this stage, organizations invest in technology and in the well-being of their employees. The working environment is stimulating and manages to leverage on individual talent. Highly motivated employees benefit from considerable autonomy, which nurtures innovation within the entity. Gamification is a common practice within the entity to engage and develop employees’ skills. The bonus system is comprehensively rewarding based on multiple performance components (individual, team, organizational). This model of maturity highlights the main stages an organization is traversing when trying to successfully put into effect its strategy and performance management system. Many organizations tend to overlook the complexity of implementing a performance management system as well as the tie-ins it has with already established organizational processes. By absorbing in other systems and processes in the organization, the performance management system also implicitly performs a health check on operations. The five stages of performance management system maturity hereby outlined provide a valuable view on the phases of a performance management system implementation project, but also unique insight into the other organizational processes it impacts in its trajectory.